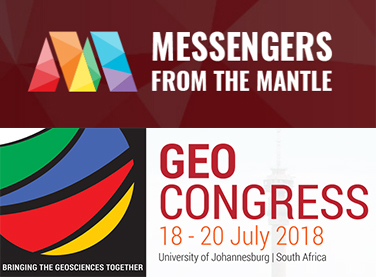 Mantle rocks visit the GeoCongress 2018! The exhibition highlights the symbiotic relationship between diamond exploration/mining and research into the Earth’s mantle. It is widely known that diamond mining has yielded rare and scientifically valuable deep Earth materials for study, but it is less appreciated that scientific analysis of these materials has generated information that has proved crucial in the exploration for diamonds. John Gurney was a key figure in the discovery and early evaluation of many diamond-bearing kimberlites in Canada, and over the past fifty years he and his students and collaborators have assembled a research collection exceeding 14,000 specimens of kimberlites, mantle rocks and related materials. It is this collection, housed at UCT in a space informally known as “the Mantle Room” (now officially the John J. Gurney Upper Mantle Research Collection), that was the source for the materials showcased in the Messengers from the Mantle exhibition. Figure: Associate Professor Philip Janney giving the exhibit opening presentation and Emeritus Professor John Gurney with exhibit visitors. The Exhibition was on display from 13 to 21 July 2018 on the 5th floor foyer of the University of Johannesburg’s Kingsway Campus Main Library in Auckland Park. It was accessible free of charge to GeoCongress delegates, as well as the public, during this time. The Palaeontological Society of South Africa - Abstracts due!